Gap junctions increase in size and abundance coincident with parturition, forming an intercellular communication network that permits the uterus to develop the forceful, coordinated contractions necessary for delivery of the fetus. 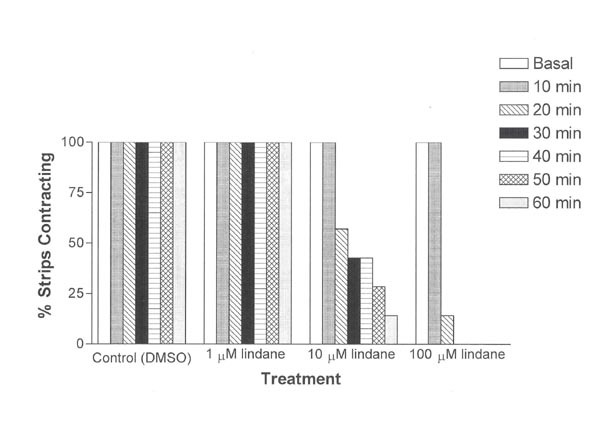 Lindane, a pesticide used in the human and veterinary treatment of scabies and lice as well as in agricultural applications, inhibits uterine contractions in vitro, inhibits myometrial gap junctions, and has been associated with prolonged gestation length in rats. The aim of the present study was to investigate whether brief exposures to lindane would elicit sustained inhibition of rat uterine contractile activity and myometrial gap junction intercellular communication. To examine effects on uterine contraction, longitudinal uterine strips isolated from late gestation (day 20) rats were exposed to lindane in muscle baths and monitored for changes in spontaneous phasic contractions during and after exposure to lindane. Lucifer yellow dye transfer between myometrial cells in culture was used to monitor gap junction intercellular communication. During a 1-h exposure, 10 micro M and 100 micro M lindane decreased peak force and frequency of uterine contraction but 1 micro M lindane did not. After removal of the exposure buffer, contraction force remained significantly depressed in uterine strips exposed to 100 micro M lindane, returning to less than 50% basal levels 5 h after cessation of lindane exposure. In cultured myometrial myocytes, significant sustained inhibition of Lucifer yellow dye transfer was observed 24 h after lindane exposures as brief as 10 min and as low as 0.1 micro M lindane. Brief in vitro exposures to lindane have long-term effects on myometrial functions that are necessary for parturition, inhibiting spontaneous phasic contractions in late gestation rat uterus and gap junction intercellular communication in myometrial cell cultures. Relatively few studies have examined toxicant actions on uterine muscle, despite widespread recognition that regulation of uterine muscle contractility is fundamental for successful pregnancy . Recent studies suggest that some toxicants inhibit uterine contraction by a mechanism that involves inhibition of uterine muscle gap junctions [2–4]. Gap junctions are intercellular channels that allow the passage of low molecular weight molecules, thereby facilitating electrical and metabolic communication between cells . It is suggested that gap junctions play an essential role in parturition by providing low resistance pathways for propagation of depolarizing signals that ultimately coordinate the contractions of the myometrium . The pesticide lindane (γ-hexachlorocyclohexane) inhibits spontaneous uterine contractions in vitro. Specifically, in vitro exposure of longitudinal uterine strips isolated from midgestation (day 10) rats to cumulative concentrations of lindane at 10-min intervals depresses spontaneous contractions in a concentration-dependent manner with an ED50 of 9.2 μM lindane and abolishes contractions at 30 μM lindane . 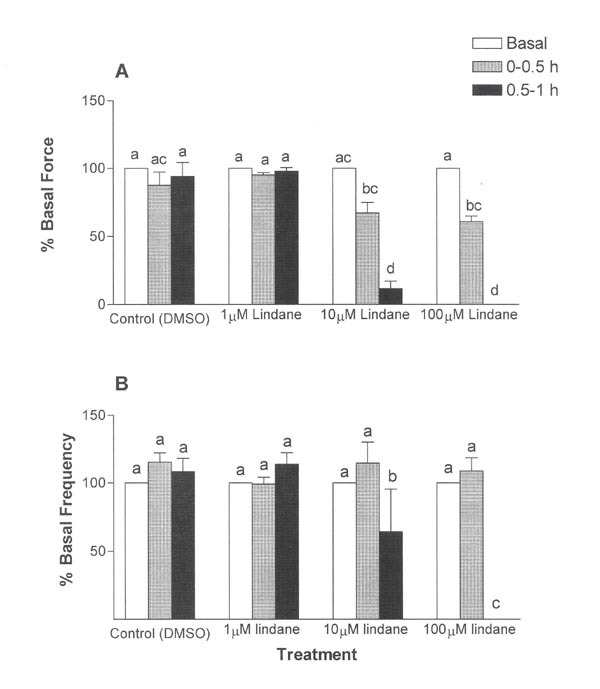 Furthermore, acute in vitro exposure to lindane (1–100 μM) inhibits gap junction communication in rat myometrial smooth muscle cells in culture . Studies suggest that activation of phospholipase C and generation of reactive oxygen species may be mechanistic links between lindane-induced inhibition of myometrial gap junctions and inhibition of uterine contractility [2, 4]. Lindane (γ-hexachlorocyclohexane) acts as an insecticide by inducing hyperexcitability [9–11]. Current and past uses of lindane provide opportunities for exposure of pregnant women to lindane. Lindane is used as a pharmaceutical treatment of scabies and lice in human medicine. It is estimated that up to1 million prescriptions for lindane, dispensed as a 1% lotion or shampoo, are written annually for the treatment of lice and scabies in the United States . Although widely used in the past as an insecticide in a variety of agricultural, forestry and household applications, the United States currently restricts lindane insecticide use to certain seed treatments  and the European Union has banned all agricultural uses of lindane . Commercial production of lindane in the USA has not been reported since 1976 . Nonetheless, environmental media remain contaminated with lindane due to its lipophilicity, persistence in the environment and widespread past usage. For example, lindane is a contaminant of 163 of the 1,467 current or former U.S. EPA National Priorities List hazardous waste sites  and lindane was detected in 55% of dairy milk samples from widespread regions of India, despite a ban in lindane production and phasing out of lindane's use in India since 1997 . A few studies of women with no known personal, occupational or accidental exposure to lindane provide some insight into exposures of pregnant women to lindane. A recent study showed that women in India who delivered babies exhibiting intrauterine growth retardation had maternal blood concentrations averaging 6.30 ± 7.51 ppb (n = 29) lindane at term, excluding an "exceptionally high" value of 365 ppb in one sample, compared to an average maternal blood concentration of 2.65 ± 2.15 ppb (n = 24) lindane in women who delivered normal weight babies . In an earlier study, concentrations of lindane at the time of delivery ranged from 7 to 136 ppb in maternal blood of 50 women in India . Similar to the finding that intrauterine growth retardation is associated with elevated maternal blood concentrations of lindane , women occupationally exposed to wood preservative mixtures that included lindane gave birth to babies with reduced birthweights and body lengths . Further supporting evidence for lindane effects on intrauterine growth comes from laboratory animal studies, with decreases in fetal weight observed in mice administered single oral doses on day 12 of gestation of 30 or 45 mg lindane/kg body weight . Moreover, lindane increased embryolethality in minks fed 1 mg/kg/day lindane in the diet , and increases of embryolethality were observed in mice exposed to technical-grade hexachlorocyclohexane (which includes lindane) administered to the mother during gestation [22, 23]. A dose of 20 mg lindane/kg body weight increased the incidence of fetuses with an extra rib in rats exposed during gestation days 6–15 and in rabbits exposed during gestation days 6–18 . However, developmental anomalies or malformations were not observed in studies of mice exposed to 30 and 45 mg lindane/kg/day during gestation days 6–12 , in mice exposed to a single oral dose of 25 mg technical-grade hexachlorocyclohexane/kg and in rats exposed during gestation to 25 and 50 mg technical-grade hexachlorocyclohexane/kg/day . A recent study found that male mice exposed prenatally to 25 mg lindane/kg body weight during gestation days 9–16 exhibited postnatal changes in spermatogenesis that reversed with age . Together, the human and animal studies suggest a link between lindane exposure during pregnancy and fetal effects. There are no previous reports of lindane actions on late gestation uterine muscle activity, yet inhibition of uterine contraction would likely have the greatest physiological consequences near term. Furthermore, although a previous report showed that brief exposure to lindane inhibits myometrial gap junctions for up to 24 h , there are no reports of sustained actions on uterine contraction after brief exposures to lindane. The present study investigated whether brief exposures to lindane would elicit sustained inhibition of rat uterine contractile activity in late gestation (day 20) uterine strips and gap junction intercellular communication in myometrial cell cultures. Concentrations used in the present study ranged from 1–100 μM lindane in the contractility experiments and 0.01–100 μM lindane in the cell culture experiments. Concentrations in the 0.01–1 μM range correspond to concentrations within ranges observed in the blood of pregnant women with no known personal, occupational or accidental exposure to lindane [18, 27]. Brief (<1 h) exposures to lindane inhibited both spontaneous phasic uterine contraction and myometrial gap junction intercellular communication in a sustained manner. The γ-isomer of hexachlorocyclohexane (lindane, 99% purity) was obtained from Sigma Chemical Co. (St. Louis, MO). The dyes Lucifer yellow and propidium iodide were obtained from Molecular Probes (Eugene, OR). Myometrial cells were cultured in RPMI medium obtained from Gibco (Grand Island, NY). The medium was supplemented with 10% iron-enriched bovine calf serum (HyClone, Logan, UT). All other chemicals were obtained from Sigma Chemical Co. Rats were housed at 24 ± 1°C under a 12-h light schedule. Female Sprague-Dawley rats between 60 and 90 days of age and weighing 180 to 220 g were mated in the colony of the Reproductive Science Program at the University of Michigan. The day of detection of sperm in the vaginal smear was designated as day 0 of pregnancy. Animal housing and handling procedures complied with institutional and NIH guidelines for care and use of laboratory animals in research. Sprague-Dawley rats were anesthetized on gestation day 20 with ether (required by a collaborator who used other tissue from the animals) and sacrificed by exsanguination. Uteri were excised, and embryos and fat were removed from both uterine horns. Longitudinal strips (2 mm × 20 mm) were excised from the midsection of each uterine horn. The strips were suspended in 50-ml muscle baths (custom-made by the University of Michigan Glass Shop) that contained prewarmed (37°C) calcium-containing physiologic saline solution (PSS; 116 mM NaCl, 4.6 mM KCl, 1.16 mM NaH2PO4•H2O, 1.16 mM MgSO4•7H2O, 21.9 mM NaHCO3, 1.8 mM CaCl2•2H2O, 11.6 mM dextrose, 2.6 mM EDTA, pH 7.4). The muscle baths and buffer reservoirs were continuously bubbled with a gas mixture of 95% O2/5% CO2. To record isometric contractions, one end of each muscle strip was tied with surgical silk to a stationary post while the other end was tied to a force transducer (Grass FT-03, Quincy, MA). Changes in contractile activity were recorded on a strip chart polygraph. All strips were subjected to a 19.6 mN preload tension and allowed to equilibrate at 37°C until regular phasic contractions developed (2–4 h). These conditions had been established in preliminary experiments as optimal for allowing development of spontaneous phasic contractions in the muscle bath. Strips then were exposed to 0.2% DMSO (solvent control), or to 1, 10 or 100 μM lindane for 1 h (n = 7), rinsed three times with fresh physiologic saline solution, and monitored an additional 5 h in lindane-free buffer to determine lindane's long-term effects on spontaneous uterine contractions. A contraction was operationally defined as an increase in force that initiated at baseline, exceeded 25% of average basal force, and returned to baseline. The maximum force displacement per contraction and the number of uterine contractions/min were used to calculate the average peak force and frequency of uterine contractions for 30-min intervals. The average peak force and number of contractions/min measured during the 30-min period immediately prior to exposure were used as the basal contraction force and frequency. The contraction force and frequency values for the exposure and post-exposure intervals were expressed as percent of basal values to adjust for variations between individual uterine strips. The average contraction force and frequency were calculated for both 30-min intervals during the 1-h lindane exposure and for the last 30 min of each hour during the 5-h post-exposure period. Analyses were not conducted beyond 5 h to avoid confounding of the results with decline of health of the tissue in the muscle bath. Myometrial smooth muscle cells were isolated from gestation day 10 Sprague-Dawley rats by methods previously described . It has previously been shown that myometrial cell cultures prepared by this method express connexin43 gap junction protein . Because myometrial cells establish functional gap junctions in culture regardless of whether the cells are isolated from midgestation or late gestation uterus , cells were isolated from midgestation uteri to take advantage of an opportunity reduce the number of animals killed by sharing animals with another investigator. Cells were seeded into flasks containing RPMI medium supplemented with 10% bovine calf serum and maintained at 37°C in a 5% CO2 atmosphere. Growth medium was changed every 1–2 days. Cells were subcultured every 3–4 days prior to reaching confluence. The smooth muscle character of the cultured cells was verified using indirect immunofluorescence labeling with mouse anti-a-smooth muscle-specific actin monoclonal antibody as previously described , and exceeded 99%. Myometrial cells were removed from flasks by exposure to 0.25% crude trypsin at 37°C for 5 min. Cells were then seeded into 35-mm dishes containing 3 ml of RPMI medium supplemented with 10% bovine calf serum at a density of 50–60 × 103 cells/dish. The cells were incubated for 24 h at 37°C in a 5% CO2 atmosphere to allow for attachment and growth. A mixed dye solution containing 0.9% (w/v) Lucifer yellow and 0.2% propidium iodide was prepared in a calcium-free and magnesium-free phosphate buffered saline and utilized to assess dye transfer. Lucifer yellow, a hydrophilic fluorescent dye with a low molecular weight, was used to monitor gap junction communication. In contrast, propidium iodide rapidly reacts with the DNA of the nucleus and serves as a marker of the injected cell. Medium was replaced with phosphate buffered saline (0.9 mM CaCl2, 2.68 mM KCl, 1.47 mM K3PO4 (monobasic), 0.5 mM MgCl2 (hexahydrate) and 8 mM Na3PO4 (dibasic heptahydrate) supplemented with 5 mM glucose prior to microinjection of the cells. An injection pressure of 6.5 psi for 200 msec was used for each injection pulse of dye (one pulse/injected cell). Scoring consisted of visual detection of Lucifer yellow dye in cells in direct contact with the injected cell, using an epifluorescence microscope (Nikon Diaphot) equipped with a G2A filter (510–560-nm excitation and 590-nm barrier) to detect propidium iodide fluorescence and a B2A filter (450–490-nm excitation and 520-nm barrier) to detect Lucifer yellow fluorescence. The dye transfer and contractility data were transformed by the arcsine transformation to correct for the nonnormal distribution of percentage data, then analyzed by one-way or two-way analysis of variance (ANOVA), as appropriate, using SigmaStat software (Jandel Scientific, San Rafael, CA). Because uterine strips were sampled over time, the contractility data were analyzed by repeated measures ANOVA with time as the repeated measure. Posthoc pair-wise comparisons of means were performed by the Student-Newman-Keuls method. A p-value ≤ 0.05 was considered statistically significant. Figure 1A shows representative polygraph tracings of muscle contractions of gestation day (GD) 20 uterine strips before and during exposure to 0.2% DMSO (solvent control) or 1, 10 or 100 μM lindane. 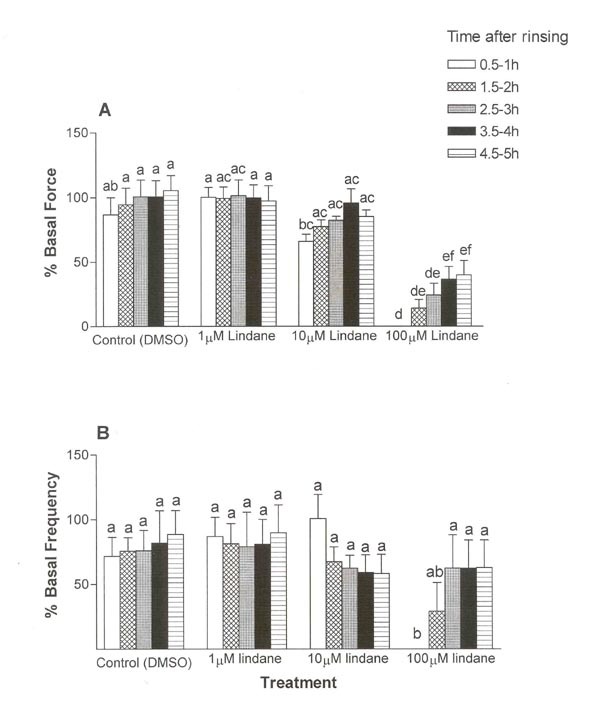 These concentrations of lindane were selected based upon previous reports that this was an effective concentration range for inhibition of contractions in GD10 uterine strips  and for inhibition of gap junction intercellular communication between myometrial myocytes in culture [8, 30]. As seen in Figure 1A, the addition of 10 μM or 100 μM lindane, but not 1 μM lindane or DMSO (solvent control), rapidly decreased the peak amplitude (force) of spontaneous phasic contractions. Inherent differences between uterine strips in basal contractility were not uncommon, as seen in the examples in Figure 1. Consequently, to quantify changes in contractions, the data were expressed as percent basal contraction force for individual strips prior to summarization, as described in Methods. Representative polygraph tracings of longitudinal muscle strips. Uterine strips were isolated from uteri of gestation day 20 rats and exposed in muscle baths to 0.2% DMSO (solvent control) or 1, 10 or 100 μM lindane for 1 h. After exposure, the strips were rinsed 3 times and monitored in fresh physiological salt solution without test chemicals for an additional 5 h. A) Five minutes prior to exposure and 30 min after initiating a 1-h exposure (arrows mark addition of test chemical). B) 4.5 hours after rinsing (10 min shown). Uterine strips treated with solvent (controls) or 1 μM lindane showed no significant differences in peak contraction force or frequency during the 1-h exposure (Fig. 2). In contrast, the average peak force and frequency of contraction decreased in concentration-dependent (ANOVA, p ≤ 0.001) and time-dependent (ANOVA, p ≤ 0.001) manners during 1-h exposures to 10 μM or 100 μM lindane (Fig. 2). During the first half hour of exposure, the average peak force of contraction was depressed by 100 μM lindane to 60.8 ± 4.0 %, a significant decrease in comparison with the 100 μM lindane group basal (pretreatment) and the time-matched 1 μM lindane treatment group (95.1 ± 1.6 %) (Fig. 2A, p ≤ 0.05), but not compared with time-matched solvent (DMSO) controls (87.6 ± 9.7 %). During the 0.5–1 h exposure period, the average peak force of contraction was further depressed by 10 μM to 11.7 ± 5.5% and by 100 μM lindane to 0.0 ± 0.0 %, significantly different from the preceding 0–0.5 h exposure period for each respective lindane treatment, time-matched solvent (DMSO) controls (94 ± 10.3%), and the time-matched 1 μM lindane treatment group (97.8 ± 2.7 %) (Fig. 2A, p ≤ 0.05). Time- and concentration-related effects of lindane on uterine contraction force (A) and frequency (B). Uterine strips were exposed to lindane (1, 10 or 100 μM) as described in Figure 1. The average peak force of contraction and the average frequency of contraction were calculated relative to basal (pretreatment) values, as described in Methods, over 30-min intervals of a 1-h exposure. Changes in contraction force and frequency were analyzed by separate repeated measures analysis of variance (ANOVA) for concentration, exposure duration, and interaction effects, with repeated measures on exposure duration. Lindane decreased uterine contraction frequency and force in concentration-dependent and time-dependent manners, with a significant interaction between concentration and exposure duration (ANOVA, p ≤ 0.001). Vertical bars with different letters have means that are significantly different from each other in pairwise comparisons (Student-Newman-Keuls, p ≤ 0.05). Values shown are mean ± SEM of 7 uterine strips. Error bars not visible are too small to be displayed graphically. Lindane effects on contraction frequency were not as pronounced as the effects on contraction force. No significant lindane effects on contraction frequency were observed during the first half hour of lindane exposure (Fig. 2B). During the 30–60 min exposure interval, contraction frequency decreased in uterine strips treated with 10 μM lindane to 64.1 ± 3.1% and with 100 μM lindane to 0.0 ± 0.0%, significantly depressed compared with time-matched solvent (DMSO) controls (108.4 ± 9.8%), the respective basal (pretreatment) for each respective lindane treatment, and the preceding 0–0.5 h exposure period for each respective lindane treatment (Fig. 2B, p ≤ 0.05). The percentage of uterine strips still contracting following exposure to 10 μM lindane was reduced in a time-dependent manner, with only 1 of 7 treated uterine strips (14%) still contracting at the end of the 1-hr exposure period. Exposure to 100 μM lindane induced an even more pronounced reduction in uterine contractions with only 1 of 7 treated strips (14%) exhibiting phasic contractions after 20 min and cessation of all uterine contractions after 30 min (Fig. 3). These contractility results show that lindane-induced inhibition of spontaneous phasic uterine contractions increased with increased duration of exposure. Time- and concentration- related effects of treatment on percent uterine strips contracting during exposure (1 h). Uterine strips were exposed to lindane as described in Figure 1. Data are expressed as the percentage of strips retaining phasic contractions at the end of a 1-h exposure to lindane or DMSO (solvent control). The buffer was removed after 1 h of exposure, uterine strips were rinsed, and fresh buffer without lindane was added to the muscle baths. Uterine strips were allowed 30 min to redevelop phasic patterns before assessment of force and frequency during the post-exposure recovery period. Representative polygraph tracings in Figure 1B show that by 3 h after rinsing, uterine strips treated with DMSO (solvent control), 1 μM lindane or 10 μM lindane exhibited contractions similar to pretreatment (basal), but that strips treated with 100 μM lindane contracted with decreased force. After rinsing, contractile force and frequency recovered in lindane-treated strips in concentration-dependent and time-dependent manners (ANOVA, p ≤ 0.001; Fig. 4). In control uterine strips exposed to solvent (DMSO) alone and in strips exposed to 1 μM lindane, neither the force nor frequency of contraction varied significantly over the 5-h post-exposure observation period (Fig. 4). Uterine strips rapidly recovered from the 1-h exposure to 10 μM lindane, generating contractions within 1 h after rinsing (during the 0.5–1 h interval) with an average peak contraction force (65.8 ± 5.9%) and average frequency of contraction (100.9 ± 18.4 %) that were not statistically different from time-matched solvent (DMSO) control averages for force (86.8 ± 13.2%) and frequency (71.9 ± 14.6 %) (Fig. 4A). Time- and concentration-related effects of lindane on contraction force (A) and frequency (B) during recovery. Uterine strips were exposed to lindane (1, 10 or 100 μM) as described in Figure 1. The average peak force of contraction and the average frequency of contraction were calculated relative to basal (pretreatment) values, as described in Methods, over 30-min intervals of a 5-h recovery period beginning 30 min after removal of the lindane exposure buffer (rinsing). Changes in contraction force and frequency were analyzed by separate repeated measures analysis of variance (ANOVA) for concentration, time, and interaction effects, with repeated measures on time. Contraction frequency and force recovered from lindane-induced inhibition in concentration-dependent and time-dependent manners, with a significant interaction between concentration and time (ANOVA, p ≤ 0.001). Vertical bars with different letters have means that are significantly different from each other in pair-wise comparisons (Student-Newman-Keuls, p ≤ 0.05). Values shown are mean ± SEM of 7 uterine strips. Error bars not visible are too small to be displayed graphically. In contrast, uterine strips exposed to 100 μM lindane initially remained quiescent after rinsing, exhibiting no contractions during the 0.5-1 h period after rinsing (Fig. 4A and 4B). Force of contraction remained depressed for the entire 5-h post-exposure observation period in the uterine strips treated with 100 μM lindane, with partial recovery in the 3.5–4 h and 4.5–5 h intervals to average peak contraction force of 36.4 ± 10.1 % and 39.9 ± 11.1 %, respectively, significantly elevated compared with the 0.5–1 h interval but remaining significantly depressed compared with time-matched solvent (DMSO) controls (105.4 ± 11.6 %) (Fig. 4A, p ≤ 0.05). In contrast to the sustained inhibition of contraction force by 100 μM lindane, frequency of contraction recovered from complete quiescence in the 0.5–1 h post-treatment period to 29.1 ± 2.2% in the 1.5 – 2 h period, an average frequency not significantly different from time-matched solvent (DMSO) controls (Fig. 4B). The frequency of contraction increased further to 62.6 ± 2.6% during the 2.5–3 h period and remained at this level for the remaining 2 h of observation. 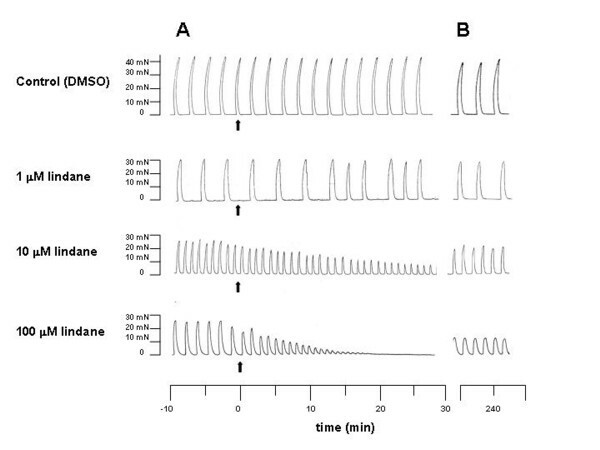 These contractility results show that lindane inhibited spontaneous phasic contractions in GD20 uterine strips in vitro and that this inhibition increased with concentration and duration of exposure to lindane. Lucifer yellow dye transfer was used to assess sustained effects of lindane on myometrial gap junctions. 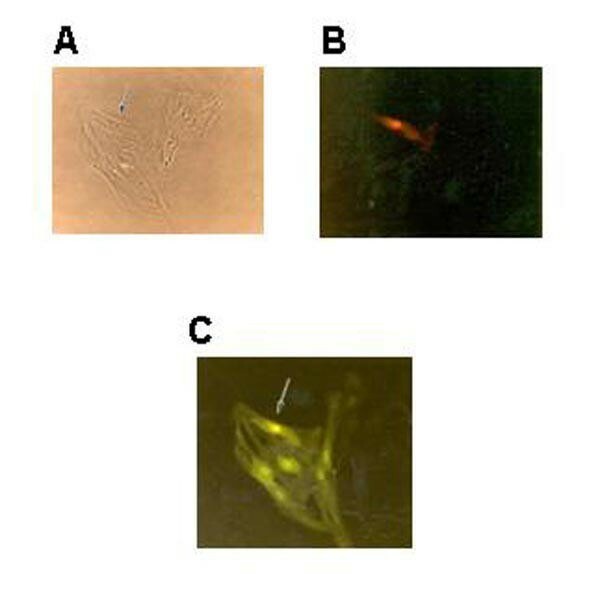 Figure 5A,5B,5C shows an example of Lucifer yellow dye transfer in a control myometrial cell culture. 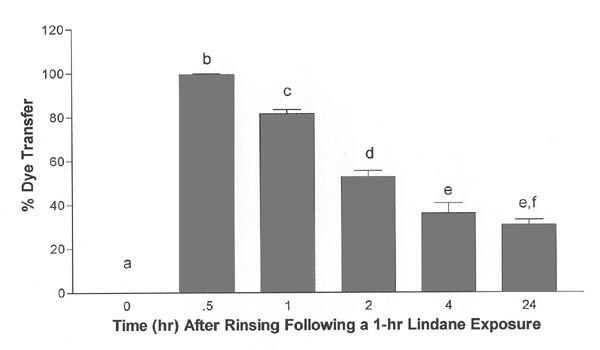 Because 100 μM lindane abolished uterine contraction force in a sustained manner in the contractility experiments, this concentration of lindane was used in initial time-course dye transfer experiments. Lucifer yellow dye transfer between myometrial cells in culture. Lucifer yellow dye injected into a single cell (arrow) transferred to neighboring recipient cells. A, phase contrast. B, epifluorescence showing propidium iodide fluorescence marking the injected donor cell. C, epifluorescence showing Lucifer yellow fluorescence in donor and recipient cells. At the end of a 1-h exposure to 100 μM lindane and before rinsing, Lucifer yellow dye transfer was abolished between myometrial cells in culture (Fig. 6, zero time point), as expected based on previous reports [8, 30]. After rinsing, intercellular transfer Lucifer yellow dye initially improved before declining again (Fig. 6, ANOVA, p ≤ 0.0001). Within 30 min after rinsing, dye transfer had recovered to 99.5 ± 0.5% (p ≤ 0.05 compared with zero time point), a level similar to that observed in solvent control cultures assessed 24 h after a 1-h exposure (98.4 ± 1.7%, data not shown on graph). However, dye transfer declined in the lindane-exposed cell cultures in a time-dependent manner to 81.6 ± 1.8% after 1 h (p ≤ 0.05 compared with 0.5 h after rinsing), and reached a minimum by 4 h that persisted for 24 h (p ≤ 0.05 compared with 0, 0.5, 1 and 2 h after rinsing; Fig. 6). This pattern of dye transfer indicates that lindane-induced inhibition of myometrial gap junction communication, as measured by Lucifer yellow dye transfer, was initially rapidly reversible, but that a secondary and sustained inhibition of dye transfer developed in the absence of further exposure to lindane after a brief delay. Time-dependent effects on Lucifer yellow dye transfer after exposure to lindane. A 1-h treatment of rat myometrial cells with 100 μM lindane initially abolished Lucifer yellow dye transfer (zero hour time-point), and then after removal of lindane exposure buffer and rinsing, this inhibition first reversed before redeveloping (ANOVA, p ≤ 0.0001). Mean values ± S.E.M. are shown (n = 3–5 culture dishes; 8–14 cells were injected per dish). Vertical bars with different letters have means that are significantly different from each other in pair-wise comparisons (Student-Newman-Keuls, p ≤ 0.05). Cultures exposed to solvent (DMSO) alone for 1 h were assessed 24 h after rinsing, and were found to transfer dye to 98.4 ± 1.7% of neighboring cells (data not shown on graph). Subsequent experiments determined the effect of exposure duration on sustained inhibition of dye transfer by lindane. Lindane decreased dye transfer to similar extents regardless of whether the duration of exposure was 10 min, 1 h or 24 h (Fig. 7, ANOVA, p ≤ 0.0001). The decrease in dye transfer was statistically greater in the cultures exposed to lindane for 1 h or 24 h compared with cultures exposed for 10 min, although the magnitude of the difference was modest (p ≤ 0.05). There were no significant differences in dye transfer between cultures exposed to lindane for 1 h or 24 h. These results show that an exposure as brief as 10 min to 100 μM lindane was sufficient to inhibit Lucifer yellow dye transfer 24 h later. Sustained inhibition of Lucifer yellow dye transfer following lindane exposures of different durations. Lucifer yellow dye transfer between myometrial cells was inhibited 24 h after initiating 10-min, 1-h or 24-h treatments with ethanol (solvent control) or 100 μM lindane. ANOVA, p ≤ 0.0001. Mean values ± S.E.M. are shown (n = 5–8 culture dishes; 7–22 cells were injected per dish). Vertical bars with different letters have means that are significantly different from each other in pair-wise comparisons (Student-Newman-Keuls, p ≤ 0.05). The effect of exposure duration on lindane-induced inhibition of Lucifer yellow dye transfer was examined further in an experiment that included concentrations ranging from 0.01 μM to 100 μM lindane. 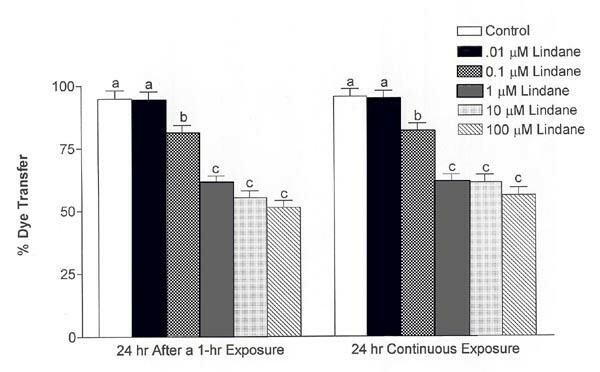 As shown in Figure 8, lindane significantly inhibited dye transfer in similar concentration-dependent manners 24 h after a 1-h exposure or after a 24-h continuous exposure (ANOVA, p ≤ 0.0001). Regardless of whether exposure was for 1 h or 24 h, 0.01 μM lindane had no significant effect on dye transfer 24 h after initiating exposure. In contrast, 0.1 μM lindane significantly depressed dye transfer to 81.1 ± 3.1% and 81.6 ± 3.1% 24 h after initiating exposure for 1 h or 24 h, respectively, compared with solvent controls (Fig. 8, p ≤ 0.05). Dye transfer was depressed further in cultures exposed to 1, 10 or 100 μM lindane compared with controls and 0.01 μM lindane (p ≤ 0.05), although a concentration-dependent response was not observed in this concentration range (Fig. 8). These results show that brief (1 h) and extended (24 h) exposures to lindane inhibited myometrial gap junction communication to similar extents, as measured by Lucifer yellow dye transfer, and that a low concentration of lindane (0.1 μM) inhibited myometrial gap junction communication in a sustained manner. 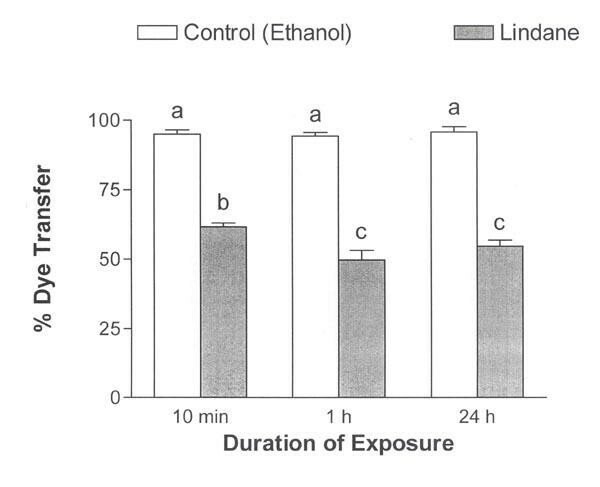 There was not a significant difference between the percentage of cells excluding trypan blue in the solvent (DMSO) control and the 100 μM lindane treatment group 24 h after exposure (data not shown), indicating an absence of overt cytotoxicity. Concentration-dependent effects of lindane on sustained inhibition of Lucifer yellow dye transfer. Lucifer yellow dye transfer between myometrial cells was inhibited in a concentration-dependent manner 24 h after initiating 1-h or 24-h treatments with 100 μM lindane (ANOVA, p ≤ 0.0001. Mean values ± S.E.M. are shown (n = 5–8 culture dishes; 7–22 cells were injected per dish). Vertical bars with different letters have means that are significantly different from each other in pair-wise comparisons (Student-Newman-Keuls, p ≤ 0.05). During pregnancy, inhibition of uterine contraction would be expected to have its greatest physiological implications in late gestation through the impairment of uterine contractions necessary for parturition. Previous studies in our laboratory showed that acute exposures to lindane inhibit spontaneous phasic contractions of midgestation (GD10) rat uteri . The present report provides the first observation that lindane inhibits contractions in late-gestation (GD20) uteri. Similar to its actions in myometrium, lindane inhibits contractions in intestinal smooth muscle  and vas deferens [32, 33], suggesting that lindane-induced inhibition of contractility may be common to smooth muscle. Myometrial gap junctions improve coordination and increase the force of uterine contraction during parturition [34, 35], whereas inhibition of myometrial gap junction intercellular communication is associated with decreased uterine contractility [2, 36]. Consistent with lindane-induced inhibition of spontaneous phasic uterine contractions, lindane abolished gap junction communication between myometrial cells in culture as measured by Lucifer yellow dye transfer. This result agrees with previous studies that showed lindane-induced inhibition of gap junction communication in rodent hepatocytes [37–39], Chinese hamster V79 fibroblasts , rat oocytes  and rat myometrial myocytes [8, 30] at similar concentrations. A brief exposure (1 h) to a sufficient concentration (100 μM) of lindane exerted long-term inhibition of uterine muscle function. This is the first report that lindane inhibits uterine contraction in a sustained manner. The partial recovery of uterine contractions from a 1-h exposure to 100 μM lindane (albeit with average peak force of contraction less than 50 % of basal /pretreatment values) suggests that the sustained inhibition is not due to irreversible cell damage. Moreover, complete recovery of contraction force was observed by 1 h after exposure to 10 μM lindane, even though contractions were abolished in 6 of the 7 uterine strips during lindane exposure. In cultured myometrial cells, no increase of cell death was detected 24 h after a 1-h exposure to 100 μM lindane, providing further suggestion that the sustained contraction response to lindane was not mediated by irreversible cell damage. Furthermore, preliminary in vivo/in vitro experiments in our laboratory showed that uterine strips excised from pregnant rats exposed to 6 mg lindane /kg s.c. on GD19 exhibited depressed uterine contractility compared with solvent controls when removed to muscle baths 24 h later (Brant, Grindatti and Loch-Caruso, unpublished). The present study provides the first demonstration that a very brief (10 min) exposure to lindane is sufficient to induce sustained inhibition of myometrial gap junction intercellular communication. Moreover, the sustained inhibition of gap junction intercellular communication by concentrations as low as 0.1 μM lindane agrees with published observations in myometrial cells , although sustained inhibition of gap junction intercellular communication was not observed in rat liver cell cultures exposed to lindane . The pattern of recovery differed for lindane-induced inhibition of uterine contractility and myometrial gap junctions. Whereas uterine strips partially regained contractility with time after removal of lindane exposure buffer, cells showed an initial rapid, but transient, reversal of dye transfer inhibition after removal of lindane exposure medium before the secondary sustained inhibition of dye transfer developed. The lack of concordance between the recovery patterns for Lucifer yellow dye transfer and uterine contractility, as well as differences in the effective concentrations, may suggest that lindane inhibits uterine contraction by a mechanism other than interference with gap junctions. Alternatively, the different recovery patterns and effective concentrations may be related to differences between the cell culture and muscle bath preparations. For example, cellular characteristics often change in culture compared with characteristics expressed in vivo or in tissue, so the myometrial cells may respond differently to lindane in cell culture than in tissue. Although the procedures used in this study produce myometrial cell cultures that express connexin43 , the gap junction protein that predominates in the pregnant uterus during parturition, regulation of gap junctions may differ in cell cultures compared with tissue. Moreover, the uptake, metabolism, and removal of lindane may differ for cells in monolayer culture compared with cells in multi-layered three-dimensional tissue in a manner that allows for a different pattern of recovery. The lowest observable effective concentration for sustained inhibition of myometrial gap junction communication was 0.1 μM lindane, a concentration that matches the average blood concentration of lindane (excluding an "exceptionally high" value of 365 ppb) observed in a cohort of women who gave birth to infants with intrauterine growth retardation . In contrast, inhibition of uterine contractility required lindane concentrations several orders of magnitude greater than blood concentrations reported in pregnant women [17, 18]. Comparisons of experimental concentrations used in the present study with human blood concentrations should be made with caution, however, given the widely different exposure conditions and widely different compositions of blood, cell culture medium and muscle bath buffer. In a previous study in which lindane was added to muscle baths in a cumulative manner at 10-min intervals, uterine strips exposed to 10 μM lindane accumulated 330 ppb lindane, relative to wet weight . Although 2000 ppb hexachlorocyclohexanes were reported in lipids extracted from uteri of pregnant women , hexachlorocyclohexane isomers were not identified individually and concentrations expressed on a lipid weight basis cannot be compared directly to concentrations expressed relative to wet weight. Inhibition of contraction increased with time during a 1-h exposure to lindane, suggesting that increased duration of exposure may allow greater concentrations of lindane to accumulate in the uterine tissue or may allow greater time for the development of the inhibitory response. The time-dependent response to lindane suggests that acute in vitro exposures may not show the maximal inhibition of uterine contraction possible with continuous or long-term exposures and that different concentration-response curves may be observed with different exposure conditions. This further supports the concern for caution in extrapolating the results of the present study to human exposures that may be longer in duration. Studies investigating the mechanism of lindane-induced inhibition of uterine contractility suggest that activation of phospholipase C and generation of reactive oxygen species are mechanistic links between inhibition of myometrial gap junctions and inhibition of uterine contractility [2, 4]. The latter studies led to the identification of a previously unrecognized role for reactive oxygen species in regulation of uterine contraction  and the partial characterization of a previously unidentified myometrial phospholipase A2 activity . Although lindane's neurotoxicity is ascribed to inhibition of GABAA channels [9–11], inhibition of GABAA channels in pregnant rat myometrium by the GABAA channel inhibitor picrotoxin stimulates contraction of uterine strips from gestation day 10 rats . Because the picrotoxin response is opposite to the inhibitory response observed with lindane, lindane-induced inhibition of uterine contraction is likely mediated by a mechanism independent of GABAA channel inhibition. Previous studies in our laboratory showed that lindane increases intracellular calcium concentration primarily through release from IP3-sensitive intracellular stores by a mechanism independent of L-type nifedipine-sensitive calcium channels . Although increased intracellular calcium concentration does not mediate myometrial inhibition of gap junction intercellular communication , elevated calcium concentrations could, potentially, impair uterine contractility by a mechanism other than inhibition of gap junctions. Furthermore, our recent study found that lindane inhibited gap junction intercellular communication by a mechanism independent of changes in the abundance and phosphorylation of the gap junction protein connexin43 in rat myometrial cells . Additionally, in preliminary studies we have found that simultaneous exposure of uterine tissues to lindane in combination with either carbachol or oxytocin reduced the force and oscillatory activity of spontaneously contracting rat uterine strips compared with exposure to carbachol  or oxytocin alone (Goel and Loch-Caruso, unpublished observations), consistent with previous reports that lindane inhibits agonist-induced contractions in vas deferens smooth muscle [32, 33]. These preliminary observations suggest that lindane interferes with agonist-induced uterine contractility as well as spontaneous contractility. Although significant differences exist between the rat and human uterus with respect to anatomy and early signals leading to labor and delivery, the events of parturition converge across the species at the level of the myometrium as gestation nears term . Because the increased formation of myometrial gap junctions is critical for parturition in both rat and human , and lindane inhibited myometrial gap junctions as well as uterine contractility, the findings of the present study suggests that lindane may have similar inhibitory actions in human myometrium. The present study shows that in vitro exposure to lindane interferes with myometrial functions that are necessary for parturition, inhibiting spontaneous phasic contractions in late gestation rat uterus and gap junction intercellular communication in myometrial cell cultures. In addition, the present study shows that lindane inhibits spontaneous phasic contractions and myometrial gap junction intercellular communication in a sustained manner, suggesting that even brief exposures of the uterus to lindane may have long-lasting actions on uterine muscle function. Lindane-induced inhibition of both myometrial gap junctions and uterine contraction is consistent with a mechanistic role for inhibition of myometrial gap junctions in lindane-induced inhibition of uterine contraction. However, differences in effective lindane concentrations and patterns of recovery from lindane-induced inhibition suggest that mechanisms other than inhibition of myometrial gap junctions, yet unidentified, may contribute to lindane's actions on myometrial gap junctions and uterine contraction. We thank Dr. Daland Juberg for initial contractility experiments performed with lindane, Dr. Craig Harris for providing rat uteri, and Dr. Mei-Ling Tsai and Dr. R. Clinton Webb for helpful discussions and technical assistance. KC conducted the cell isolation and Lucifer yellow dye microinjection and transfer studies. KB and CG conducted the uterine contractility analysis, and assisted with data analysis and graphics preparation. KB also assisted in the final preparation of the manuscript. RC directed the research design, analysis and interpretation, and prepared the final manuscript. All authors read and approved the final manuscript.